You may not have noticed that some words like ‘and’ and ‘or’ do have a special meaning if you use them in a filterable af:table. 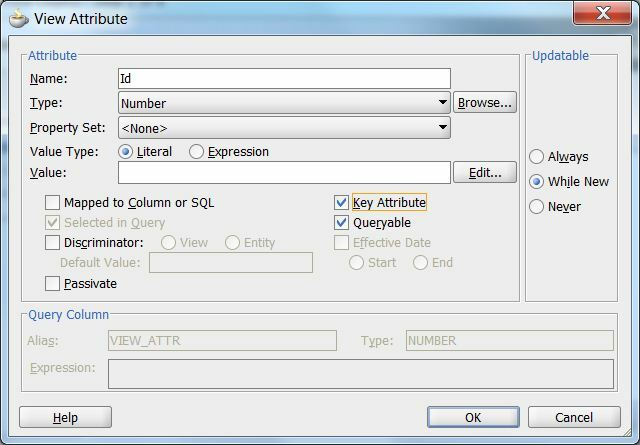 If a column of a db table contains some text which you like to filter via the Query by Example (QBE) feature of the af:table, you’ll notice that you can’t filter for ‘and’ and ‘or’. 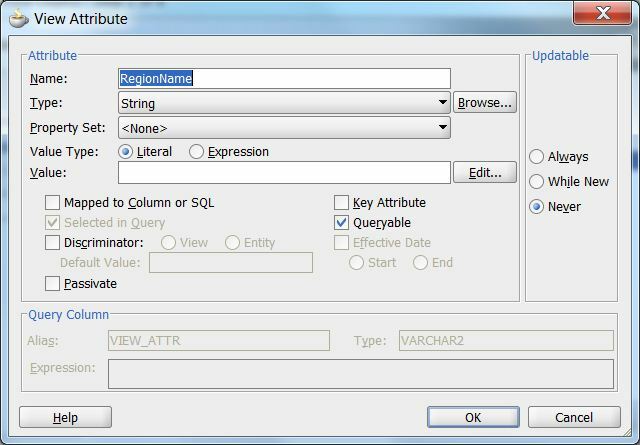 These words are used as SQL operands for character columns, like ‘>’ or ‘<‘. There is no property to escape these words do that they are treated as normal words. 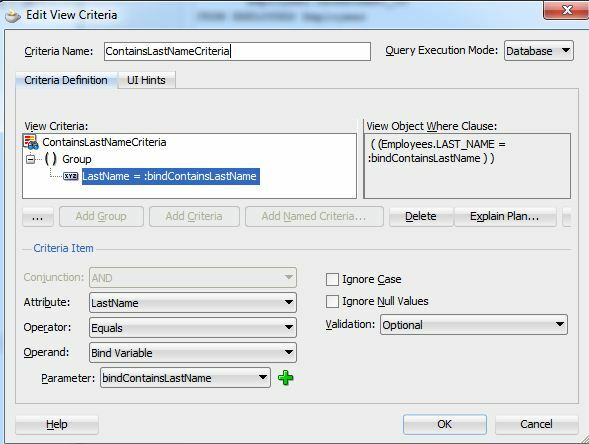 For a full list of QBE operands check the Table 27-2 Query-by-Example Search Criteria Operators. In this post we learn how to implement such an escape mechanism. 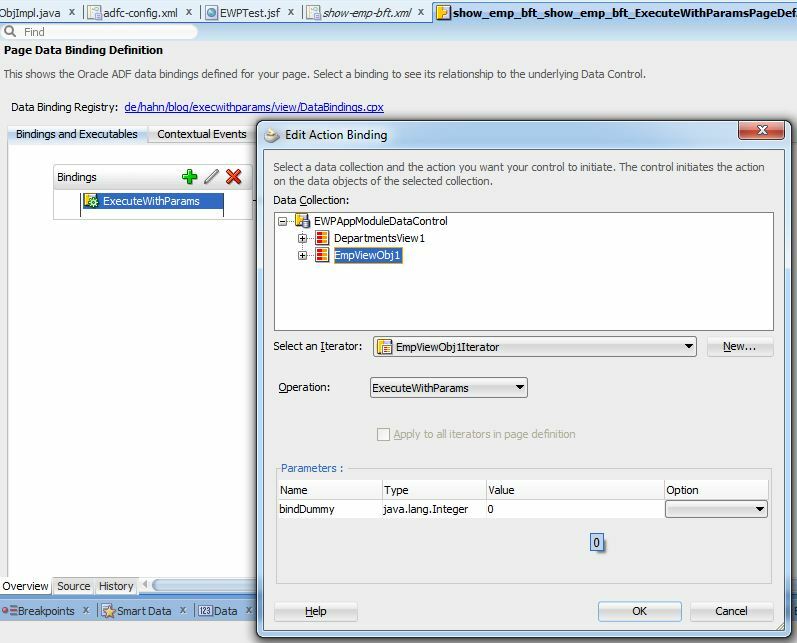 The sample work space, which used the HR DB schema, can be down loaded using the link provided at the end of the post. 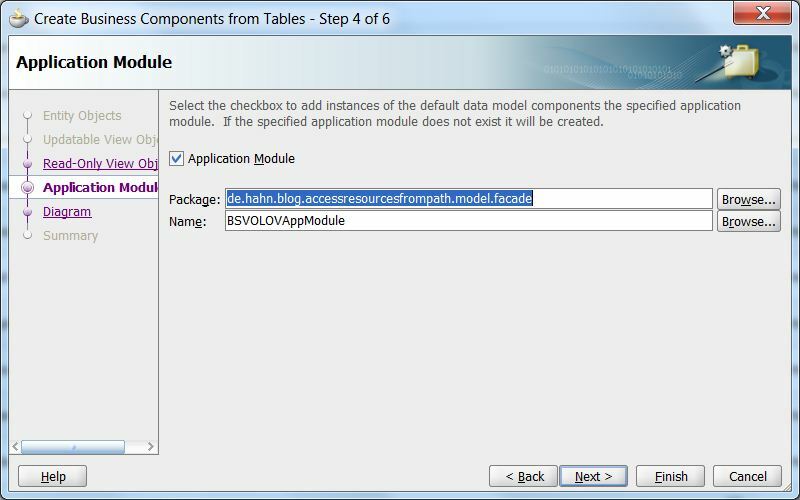 The solution for the problem is implemented on the vo the table is based on. Surprisingly no change is needed in the view controller. 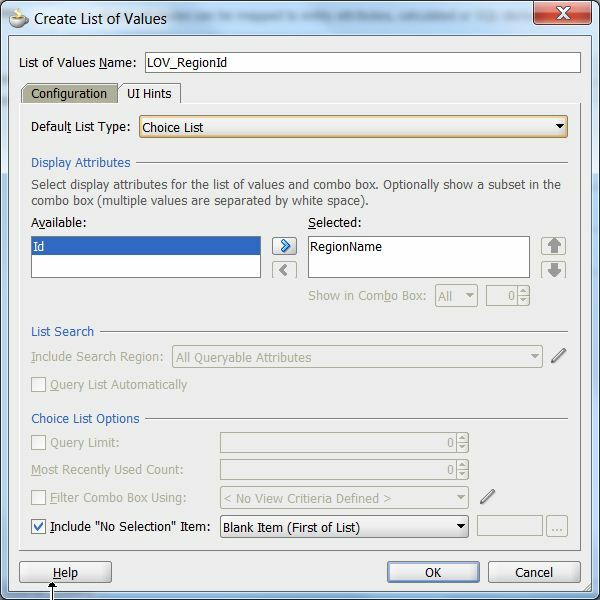 We only need to overwrite one method on the ViewObjectImpl which is used to generate the where clause part out of the filter criteria. Before we go into the details let’s look at the running application, the problem, and it’s solution. 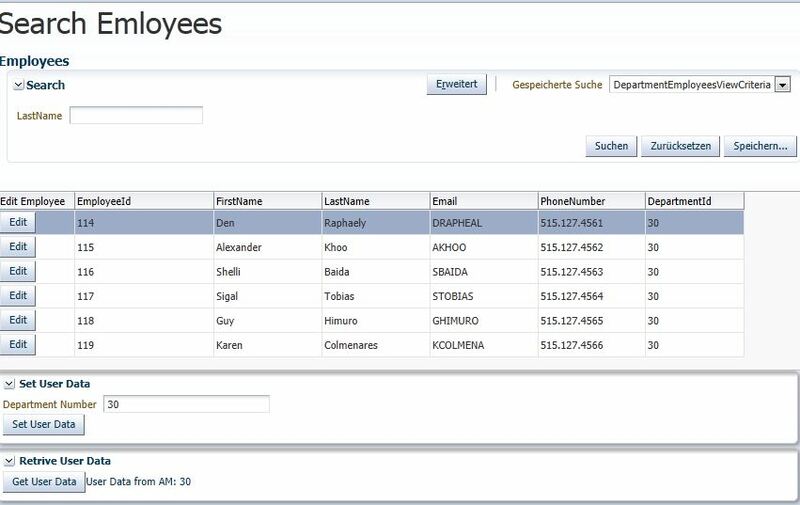 To show the problem without the need to change to much in the HR db we use the FirstName and the LastName column of the employees table. Here we change one or more entries do that they contain the word ‘and’ and ‘or’. In the image the changed lines are EmployeeId 202 and 203. As you see in the image above you get no row if you enter e.g. ‘Pat and John’ into the filter column of the first name. 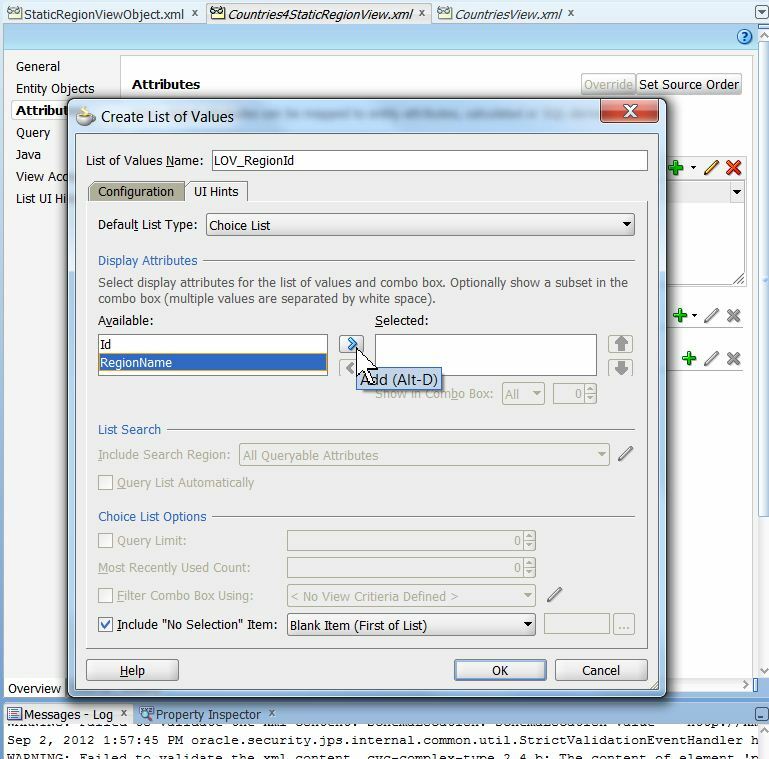 The reason is that the QBE feature build two where clause parts out of the one filter value as down in the output below. As mentioned before this is a feature and not a bug. However, the are use cases where we need to filter for the words which are treated as operands. We use a trick to escape the operands. We surround the operands by ‘_’. Then they are not treated as special words any more but as normal text. 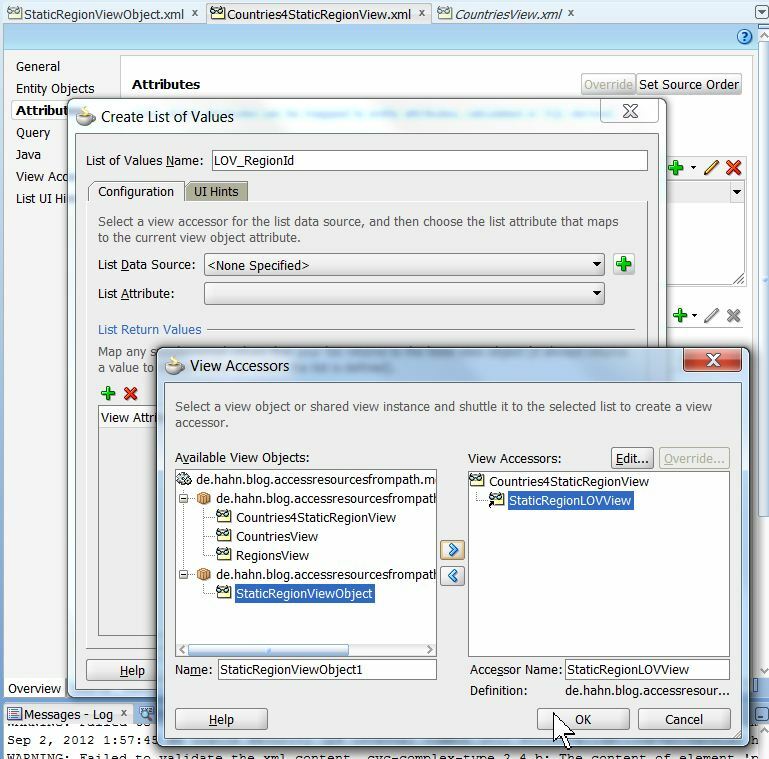 For this we overwrite the ‘public String getCriteriaItemClause(ViewCriteriaItem vci)’ method in the ViewObjectImpl. * @return null if we use hte default where clause, the where clause part if we want to change the default. 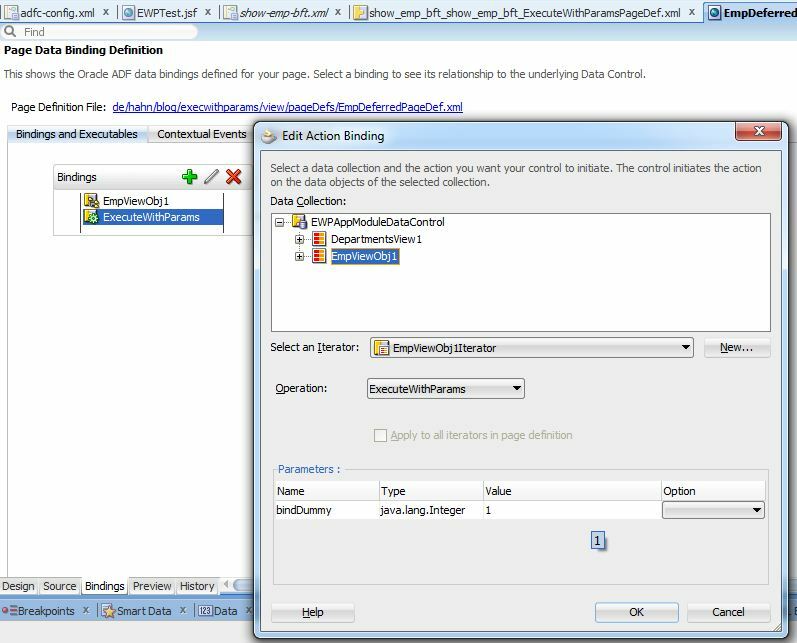 As the method is called for every criteria item we have to check if the current criteria is of type string as only string criteria react on the operands. Then we need to create the where clause part for the criteria our self. The method implements this only for the ‘startswith’ operand! If you need this for other operators too, you have to add the code to build the where clause at the commented point. 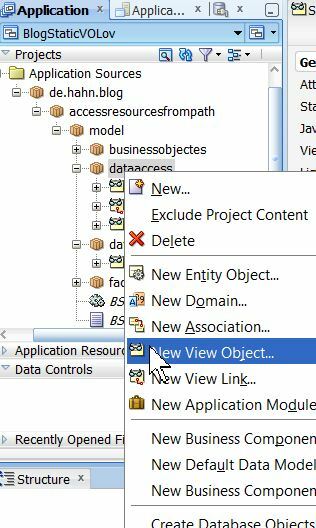 This blog shows how to set up a static ViewObject in a model project and use this static data as lookup data in an other ViewObject as LOV. 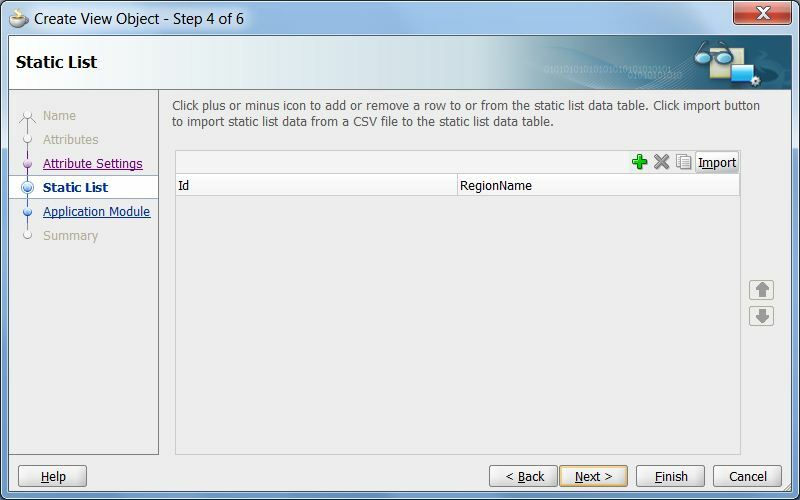 Static lookup data can and should be put into a shared application module, as the data seldom change during the live of the application using the static data. This we’ll leave for another blog. 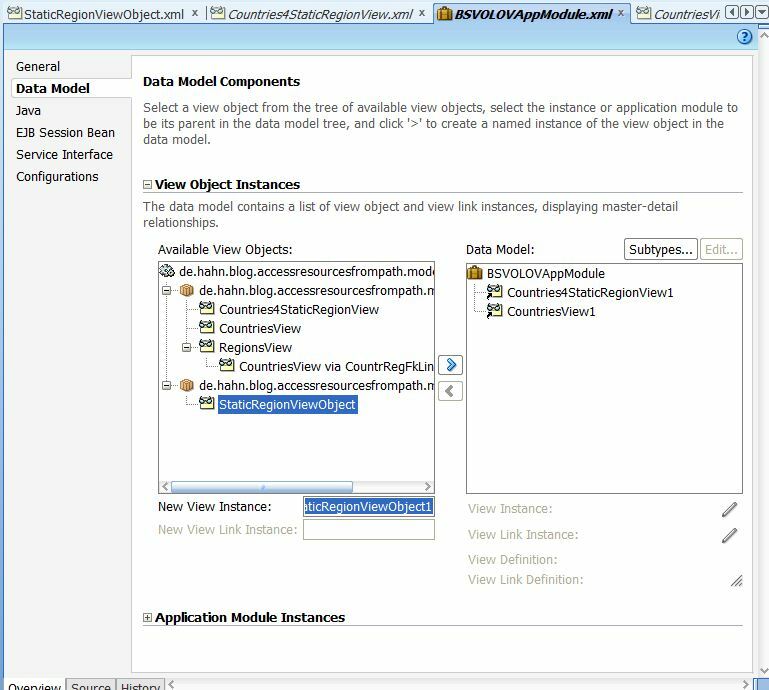 Here we create a model project and create a simple static ViewObject which we then use in another as choice list. The sample was build using JDeveloper 11.1.1.6.0 and uses the HR schema. To get the workspace use the link provided at the end of this blog. 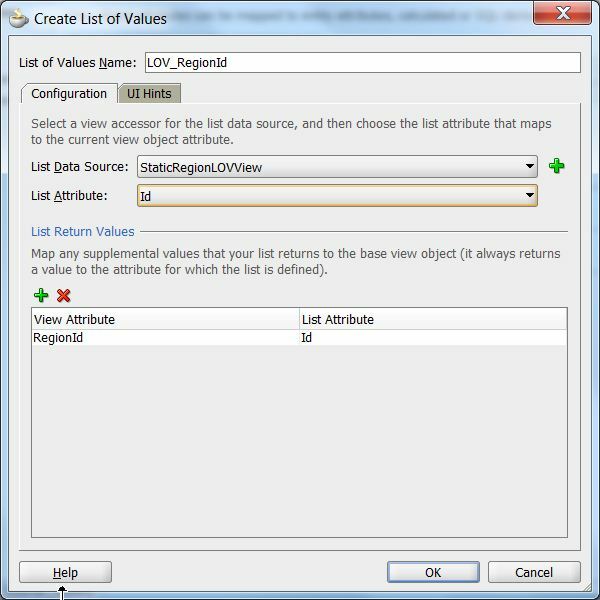 We need some static data as lookup for an other attribute which resides in a view object. 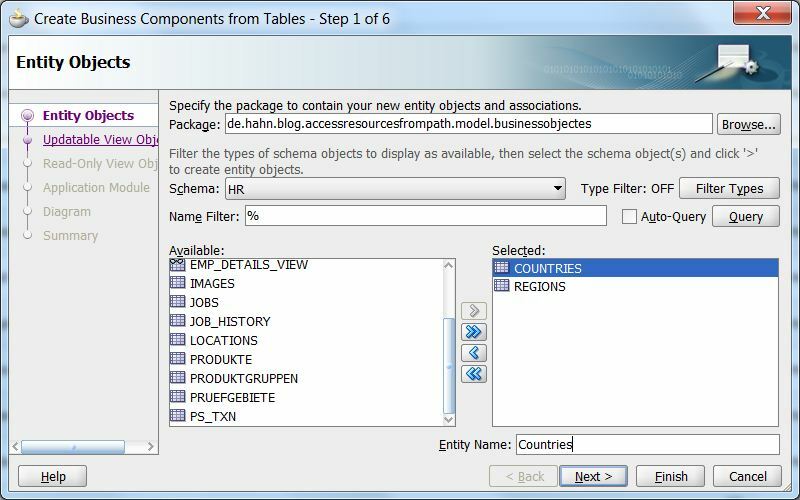 In this sample we use the COUNTIRES table from the HR schema which has an foreign key RegionId to the REGIONS table from the HR schema. 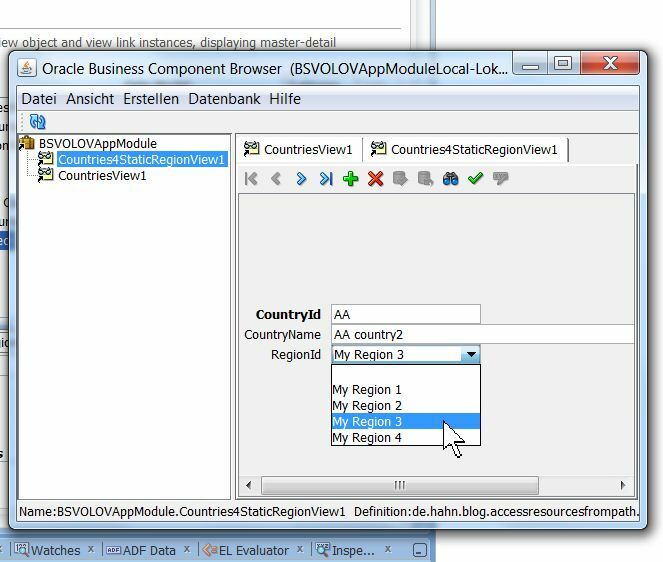 Instead of using the REGIONS data directly, we setup a static view Object which holds the data to be shown for the foreign key in the UI. 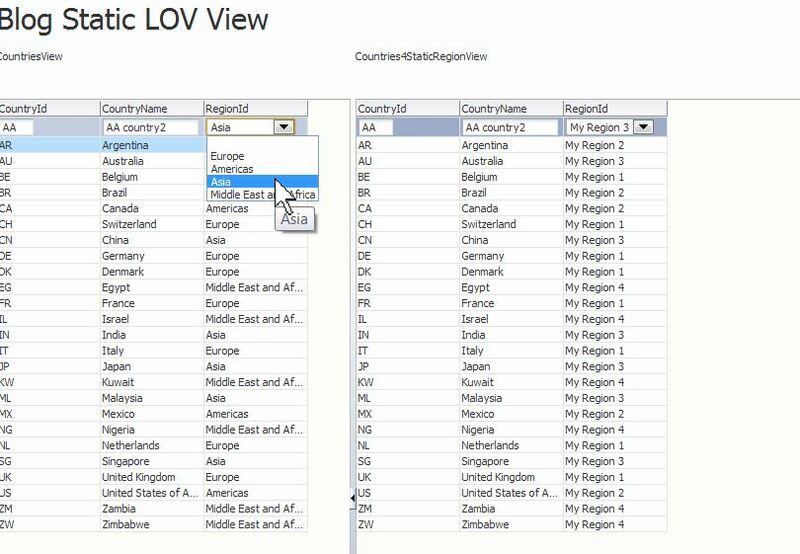 To show the difference, we also setup the lookup data using the REGIONS table data. 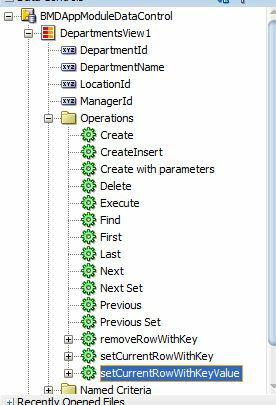 Next we create a new ViewObject which we define as ‘Rows populated at design time (Static List)’ which we use as lookup table. 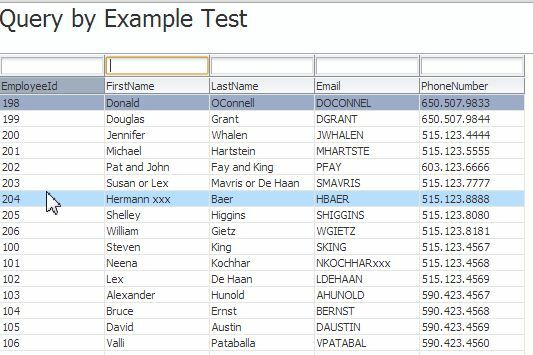 Define the attributes and their data types. 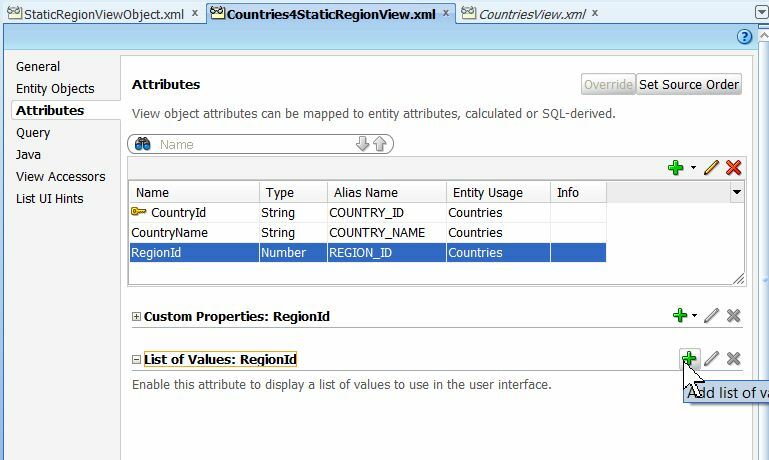 In this case we use an id (Number) and a String type as region name. 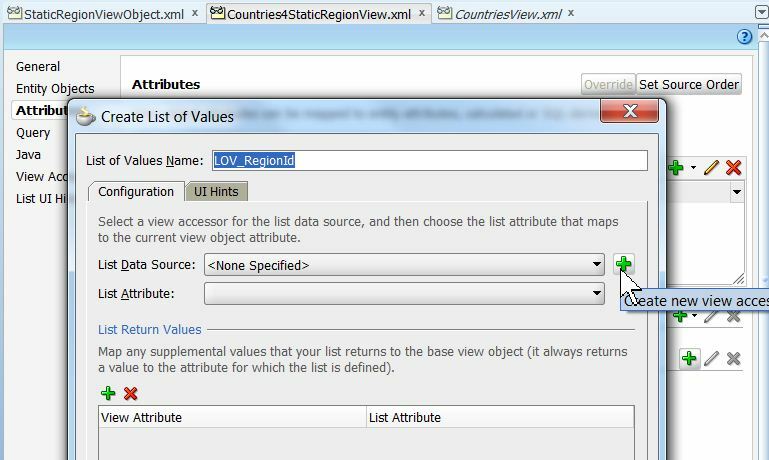 Next after the attributes for the static view are defined we add the values. Here you can enter as many rows as you like. There also can be more then two attributes. The sample only needs hte two attributes. 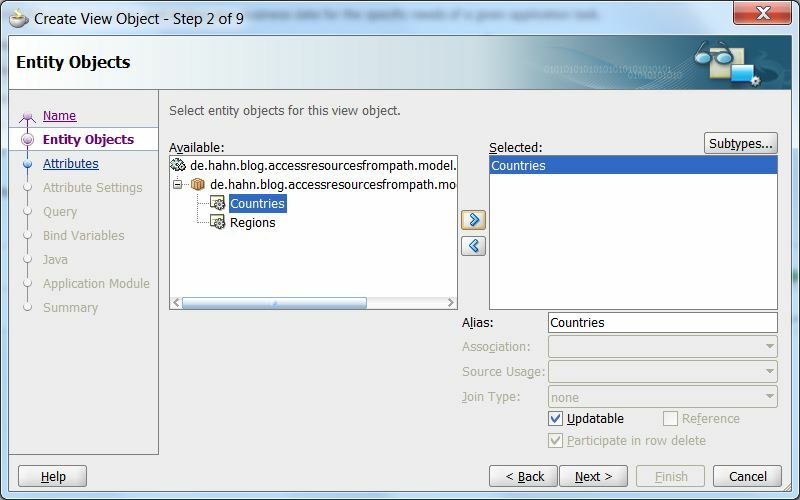 For the sample we define a second view object based on the COUNTRIES table of the HR schema. 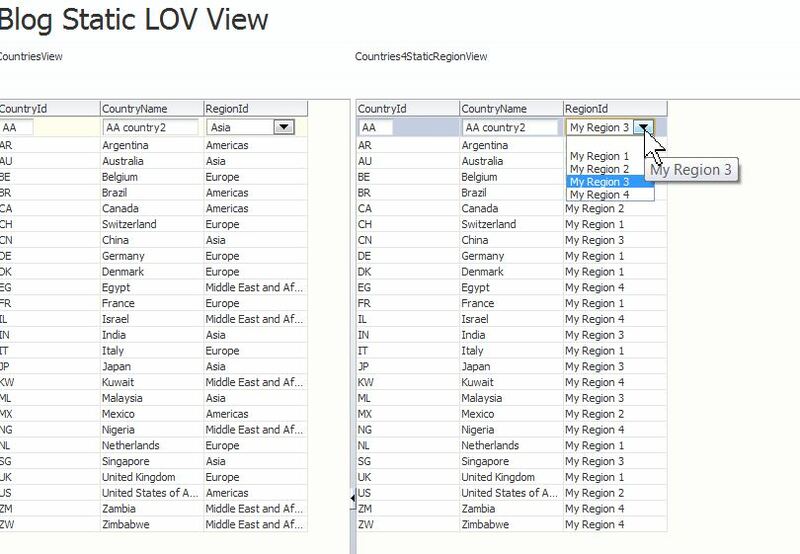 We use the two identical VO to show how to setup the LOV for the RegionId once using the entity based VO RegionView and once to setup the LOV using the static VO created before. The same action are done for the CountriesView, only here we select the RegionsView as list source. 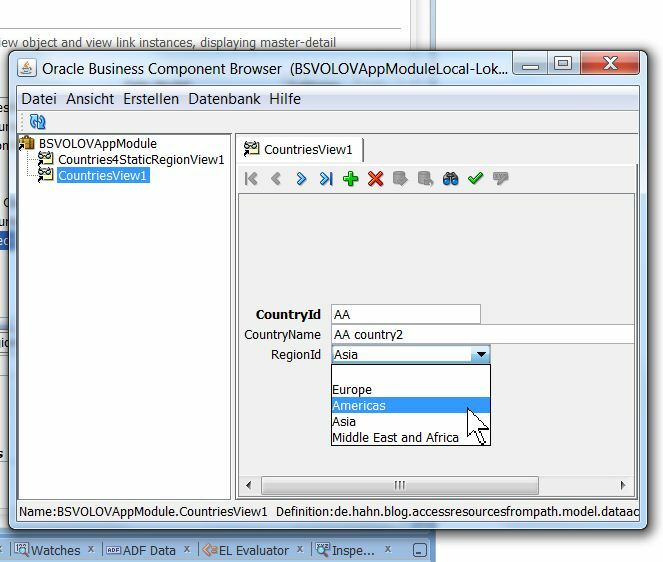 Finally we add the new views to the data model of the application module. All other views we delete as we do’t need them. 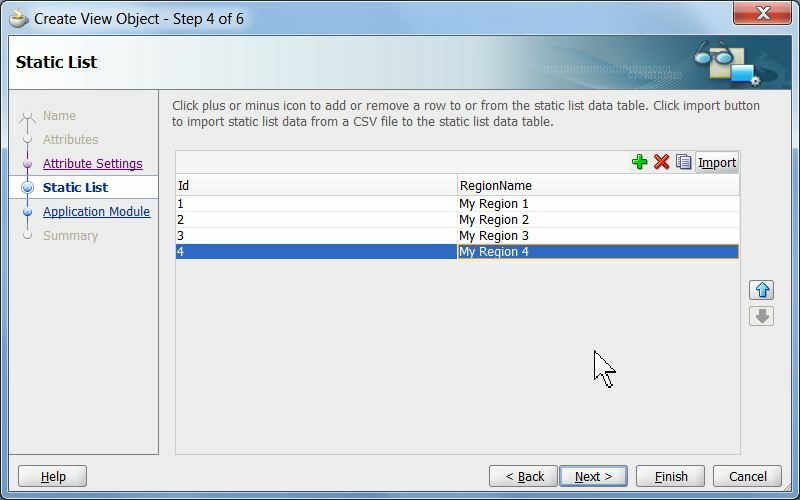 As expected we once see the region name from the regions table and once we get the static data we added to our static VO. The final step for this blog is to setup a page in hte UI. For this we create one page with an af:panelSplitter. on hte left side we drag the CountriesView1 from the data control and drop it as ‘ADF Table…’. 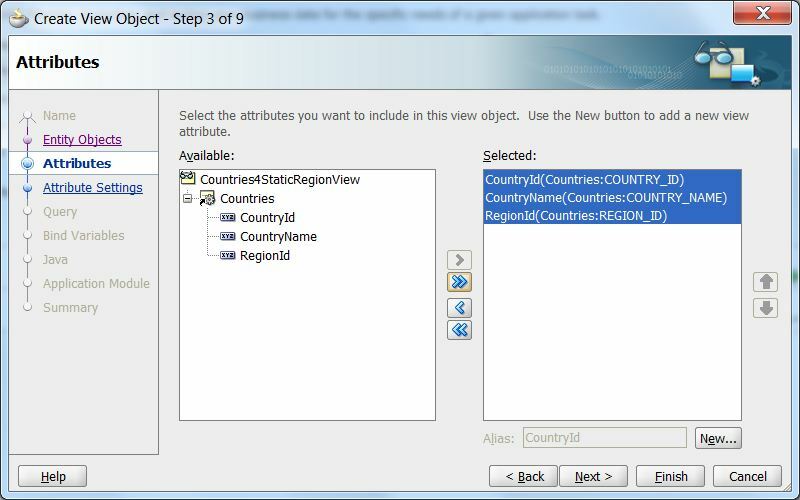 On hte right we drag the Countries4StaticRegionView1 and drop it as ‘ADF Table…’ too. 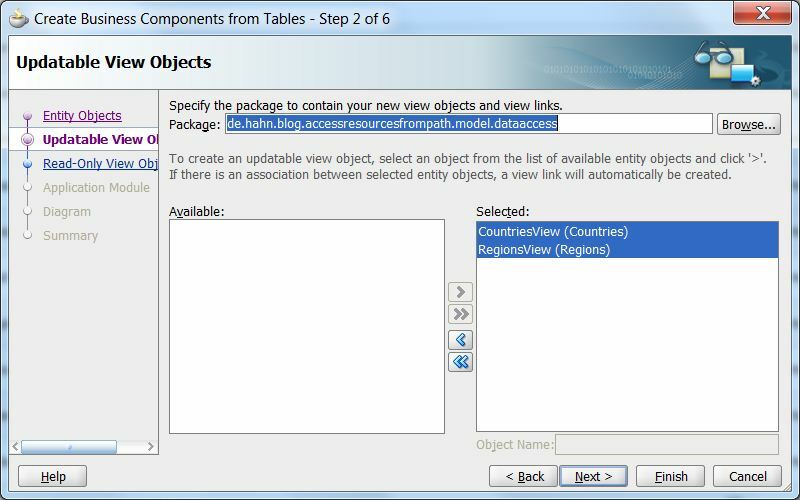 We set the table to select single and allow sorting. Finally we set the table to ‘Click to Edit’ mode so that only on row can be edited at once. You can download the workspace of the sample from here: ADF EMG Samples: BlogStaticVOLov.zip. 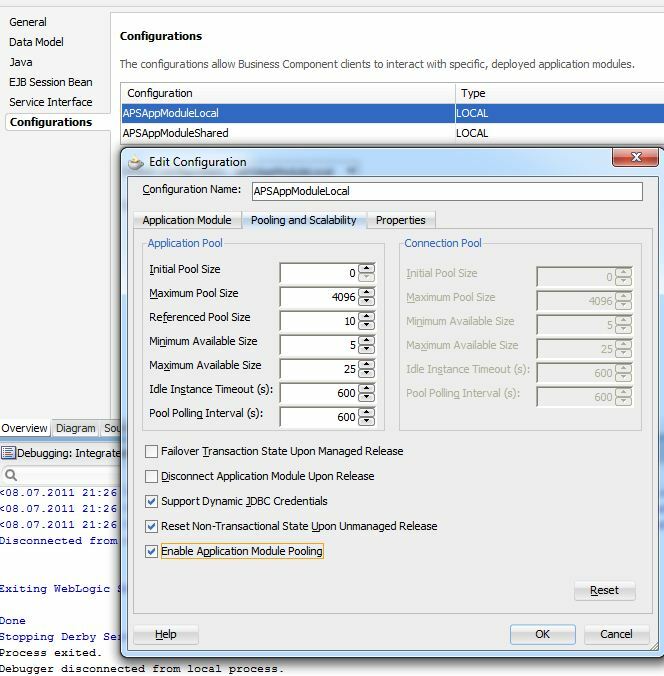 The sample uses the HR schema and was build using JDeveloper 11.1.1.6.0 but should run in 11.1.1.5.0 and 11.1.2.x too. A user on the OTN forum asked a question how to do a master detail like navigation where the master VO is not equal to the detail VO and no accessors or link is available between the tow VOs. A use case for this scenario is e.g. you have a read only table as master which holds an attribute which is the foreign key to an other table (the master table has a FK to the detail you like to change). 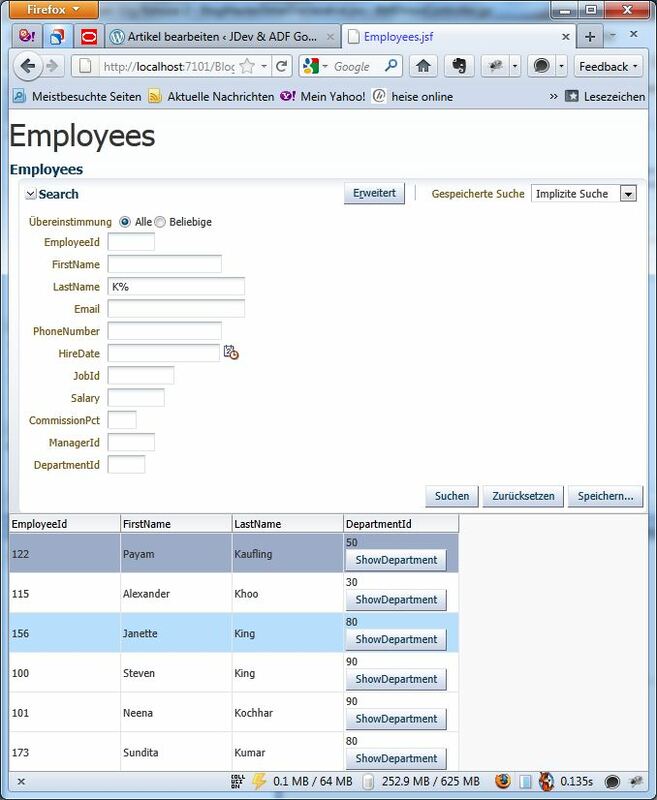 In the sample I’m talking about in this blog I used the HR schema, the employees table as master and the the department as detail. 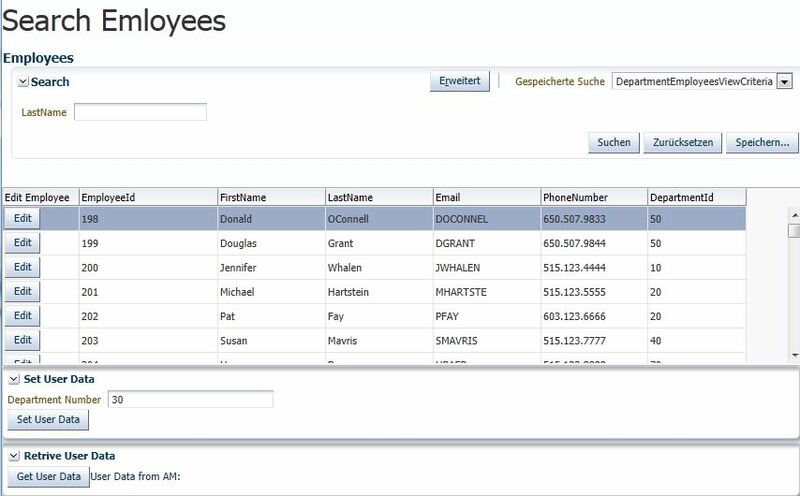 I show how to use the employees as read only table, select an employee to edit the department the employee is assigned to. As you can see there are no view links defined which could be used to navigate from the employee to the related department. I’ll do all this the declarative way, so I don’t use a bean or other Java code. 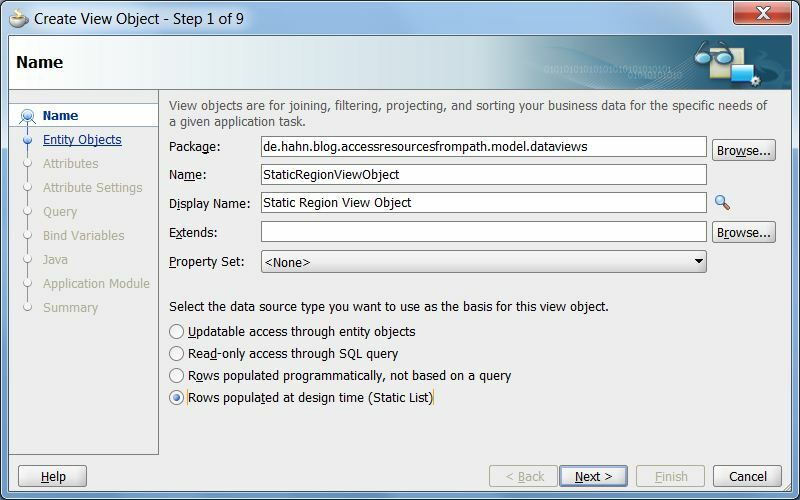 I use a bounded task flow and start with a query panel with the read only employees table. Each row shows the id of the employee, the name and the department id. I add a button to the department id of each row and use this to navigate to the departments edit page. Here you see the running app, the query panel which I used to select employees records and the button which I added to the department is column. 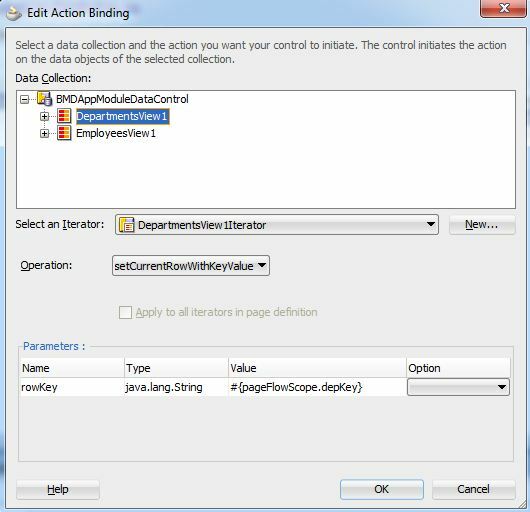 As you see the whole work is done in bounded task flow which first presents the query panel together with the resulting employees table (read only). 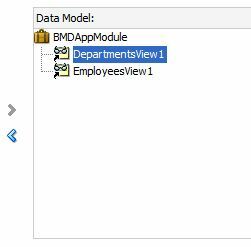 The column ‘Department ID’ shows the button I use to navigate to the editable departments page. As there is no view link, it’s not enough to select the employees row to mark it as current row. 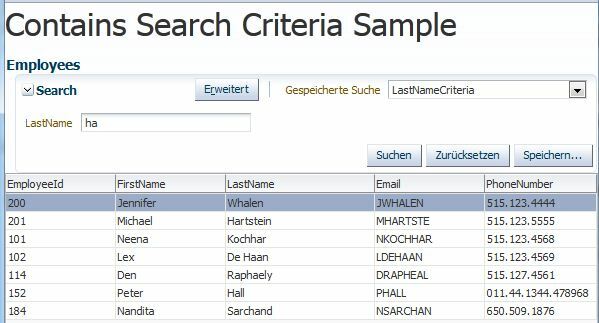 I have to extract the department id from the selected row and use this to search for the department before showing the departments edit page. After the search the current row is set in the DepaertmensView1 and I can navigate to to the edit page. That’s about it. 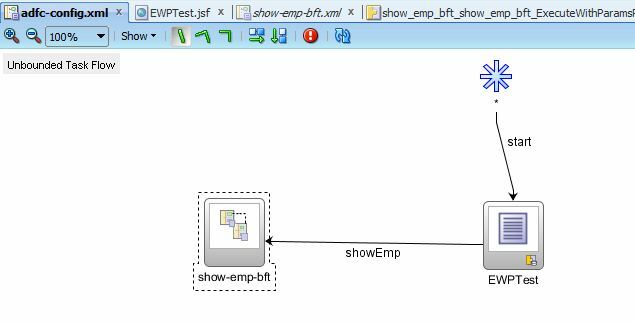 You can download the sample work space from here Sample Workspace blogmasterdetaildeclarative_v2-zip. You have to rename the file to ‘.zip’ after download! Based on a request on JDeveloper and ADF forum I wrote a small method to dump the query of a VO together with it’s bind variables (autom. inserted by the framework and user defined) and their values. 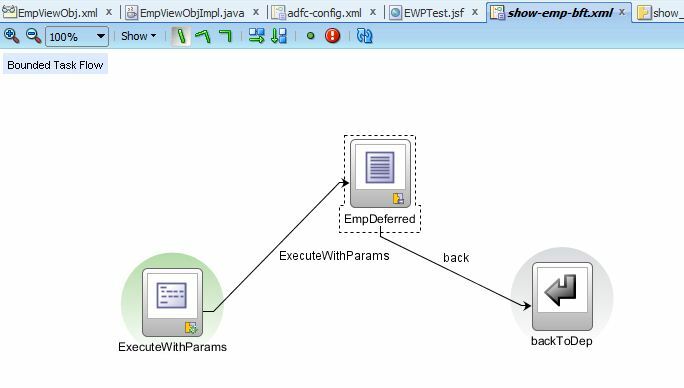 The nice part of this method is that it dumps user defined bind variables as well as automatically added variables by the framework. In the output above vc_temp_1 is a variable of a filter entered in an af:table component.